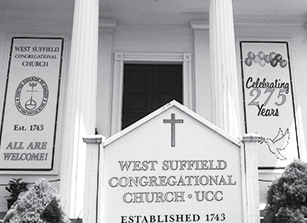 The West Suffield Congregational Church celebrates its 275th anniversary. The main 275th Anniversary celebration will be held the weekend of November 10 and 11, 2018. There will be an open house at the church itself on Saturday afternoon, November 10. The quilt will be on display in a new case. Given that the quilt is 130 years old, it is in remarkable condition and worth checking out. The items presently at the King House Museum and additional historical treasures may also be viewed at this time. Parishioners will be present to share personal memories and answer questions. There will also be a special worship service on Sunday, November 11, 2018. The anniversary worship service will incorporate aspects of the church’s history. Previous members of the congregation and pastors will be invited to this special service.